Situated in the historic city centre of St Petersburg, TAIGA Hostel is a cozy design hostel which is included in the TOP-10 hostels of Saint Petersburg and TOP-100+ design hostels worldwide according to Hostelgeeks.com. 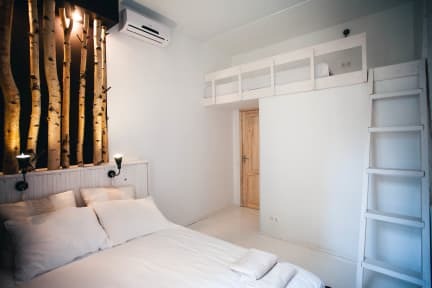 All the rooms have unique design which is a mix of neo loft and shabby chic styles. There are two dormitories (5-bedded and 10-bedded) and a range of private rooms for up to 4 people with en suite or shared bathrooms. Each room has an air conditioner; almost all the private ones have a large flat-screen TV-set. There are several shared bathrooms and shower rooms so nobody has to queue even if all the rooms and beds are booked. The kitchen is equipped with an oven, stove, microwave, electric kettle, blender, and crockery. There are also an iMac and a Dendy console, books and magazines, and some board games in the common area. High speed Wi-Fi connection is provided free of charge as well as tea, coffee, and sugar. The hostel also has a parking area of its own.